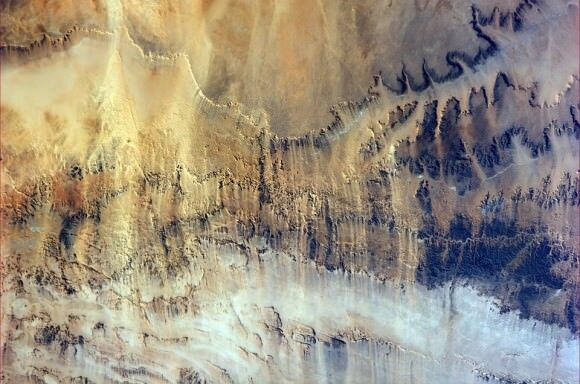 Spectacular snapshots of the Southern Lights, Shooting Stars, the Sahara Desert and much more are streaming back from space to Earth courtesy of Alexander Gerst, ESA’s German astronaut currently serving aboard the International Space Station (ISS). See a gallery of Alex’s stunning space-based views (sagenhafte Weltraum bilder) collected herein – starting with the auroral fireworks seen from space – above. It coincides with the Earth-based fireworks of America’s 4th of July Independence Day weekend celebrations and spectacular Noctilucent Clouds (NLCs) wafting over the Northern Hemisphere. NLC gallery here. “Saw a beautiful Southern Light last night. I so wish you could see this with your own eyes!” Alex tweeted in English. Gerst is posting his Earth & space imagery from the ISS on a variety of social media including Twitter, Facebook, Google+ and his ESA astronaut blog bilingually in English and German. “Habe gestern ein wunderschönes Südlicht gesehen. Ich wünschte ihr könntet das mit eigenen Augen sehen!” Alex tweeted in German. Gerst launched to the ISS on his rookie space flight on May 28, 2014 aboard a Russian Soyuz capsule along with Russian cosmonaut Maxim Suraev and NASA astronaut Reid Wiseman. The trio are members of Expeditions 40 and 41 and joined three more station flyers already aboard – cosmonauts Alexander Skvortsov & Oleg Artemyev and astronaut Steve Swanson – to bring the station crew complement to six. Alex will spend six months on the ISS for ESA’s Blue Dot mission. He is Germany’s third astronaut to visit the ISS. He is trained as a geophysicist and a volcanologist. Gerst also has practiced and honed another talent – space barber! He shaved the heads of his two American crew mates – to match his bald head – after winning a friendly wager with them when Germany beat the US in a 2014 FIFA World Cup match on June 26. Here’s several of Alexander Gerst’s newest views of the Sahara Desert and more. Stay tuned here for Ken’s continuing ISS, OCO-2, GPM, Curiosity, Opportunity, Orion, SpaceX, Boeing, Orbital Sciences, MAVEN, MOM, Mars and more Earth & Planetary science and human spaceflight news. Learn more about Orbital Sciences Antares ISS launch on July 11 from NASA Wallops, VA, and more about SpaceX, Boeing, commercial space, NASA’s Mars missions and more at Ken’s upcoming presentations. Cupola dreams…. and a humorous video is a great way to end this holiday weekend! Thanks for being there for us Ken!